Welcome the celebrated golden colors of autumn into your home with these recycled, spray painted candy corn vases. They are simple and inexpensive to make, yet happily combine vivid hues of yellow, orange-gold, and white. I found them perfect for these fresh bouquets of fall garden mums in sunshine yellow and rusty gold. They would also beautifully complement sprays of color-changing maple leaves or sunny goldenrod. 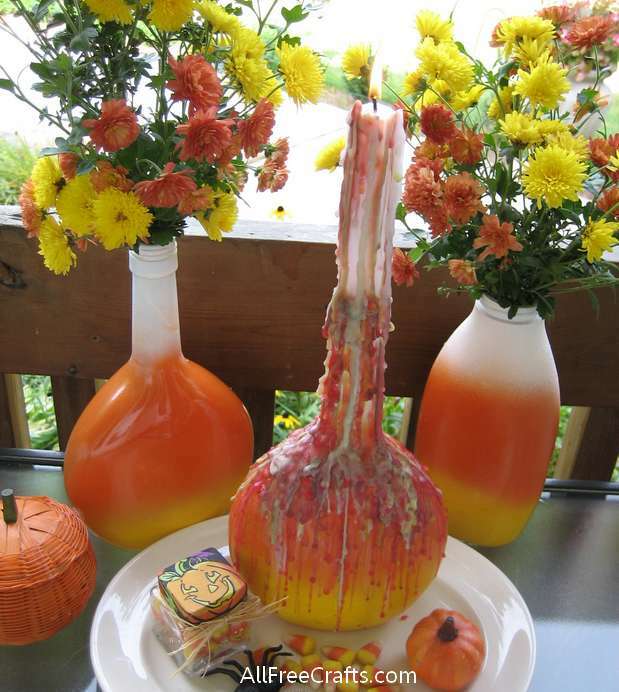 And, of course, candy corn decorations are right at home for Thanksgiving or Halloween decorating. , which you should be able to get locally or online at Amazon. I imagine other brands designed for plastic or glass would also work well). 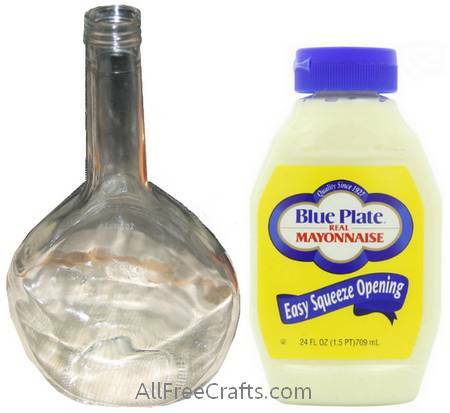 Wine bottles or squeeze-type mayonnaise bottles are ideal for this recycling project. When choosing the base containers for your candy corn vases, keep in mind that candy corn is traditionally a triangular shape. Ideally, you’ll want a bottle or jar that is about 9 inches high, or taller, with a wide base and narrowed top. The height is important because you need enough room to spray three overlapping swathes of spray paint without masking. I recycled a plastic, squeeze-type mayonnaise bottle and a glass 750ml Mateus wine bottle. Wash the bottles, removing any grease or fingerprints, and dry them thoroughly. Spray painting should always be done outdoors, or in a very well-ventilated area. If working indoors, use a cardboard box or spread lots and lots of newspapers to catch the overspray. There will be lots of overspray. Wearing hand and arm protection while spray painting a bottle. Wear plastic or vinyl gloves to keep your hands clean and free of paint. At one point, when I was holding the wine bottle while spraying the paint, the overspray went past the end of my hand and I ended up making a plastic sleeve from a grocery bag, fastened around my wrist and elbow with rubber bands. Shake the aerosol can for two or more minutes to agitate the paint formula for even spraying. 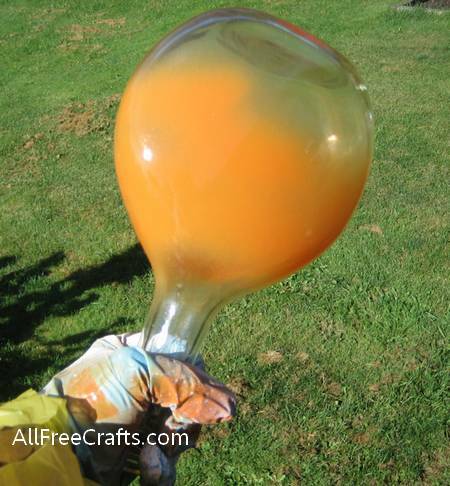 Hold the wine bottle in one hand, or stand it inside a cardboard box, and aim a light coat of orange paint in a band around the middle of the bottle as you rotate it for coverage all the way around. Don’t worry if this middle band is wider than desired, as you will be covering up some of the top and the bottom with the next layers of color. For each application of paint, keep the spray even and light. This means keeping the nozzle a certain distance away from the surface, applying only short, light bursts of spray, and moving the bottle steadily around as you work. Practice a little bit by spraying on newspaper until you get the hang of how quickly the paint flows. The paint should look somewhat sparse and transparent. After a few minutes, you can apply a second coat of paint. You’ll soon realize if you have applied the paint too heavily, but by then it’s too late. It will be running. Believe me, I know. Allow the orange paint to dry. Spray yellow paint around the bottom of the bottle, but overlapping the orange paint by and inch or so, or whatever level looks best to you. Finish by spraying the top third of the bottle in white, again allowing the white to overlap the orange. 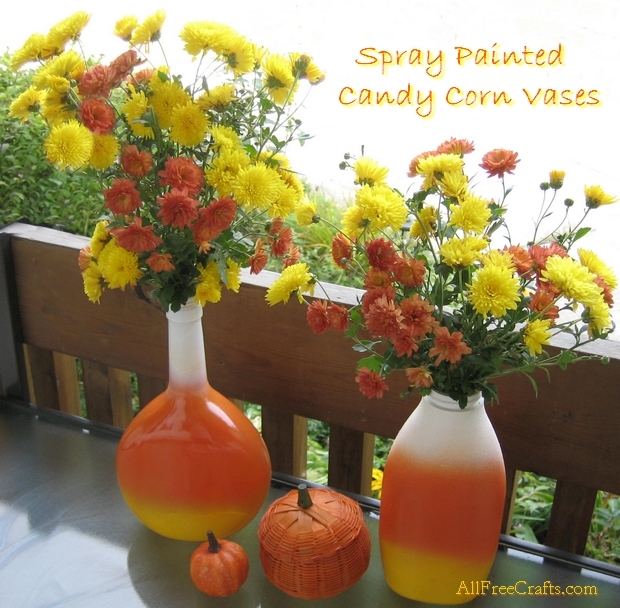 Vibrant, spray-painted candy corn vases look fab with orange and yellow mums, sprays of goldenrod, or bouquets of color-changing maple leaves. I love them as they are for fall, but it’s been a long time since I made this Wine Bottle Drip Candle and since I now had two Mateus wine bottles spray painted in candy corn colors, it seemed natural to use one of them to make a wine bottle drip candle for Halloween. I haven’t posted this in the Halloween section as yet, but here’s a preview peek. I’m sure you’ll find it easy enough to make your own.